Hungary expects right to win upcoming elections, radical right-wing party says 'Jews have nothing to fear' from them. Hungary's left-wing parties are certain to fail at Monday's presidential vote but have already won a victory of sorts, forming a rare united front against Prime Minister Viktor Orban. Ahead of next year's general election, challenges to the powerful right-wing premier are taking shape on both left and right, although few are speculating they will be strong enough to turn Hungary's populist tide. The parliamentary vote for the largely ceremonial presidential role is a mere formality given that Orban's ruling right-wing Fidesz party, in power since 2010, holds close to a two-thirds majority. In the last election five years ago, Orban's ally Janos Ader ran uncontested. But on Monday, Ader, standing for reelection, faces respected former ombudsman Laszlo Majtenyi who has managed to unite normally warring leftist parties, all of whose 43 lawmakers in the 199-seat house have pledged to vote for him. "It's significant because for once they support a single candidate even though they don't like each other," analyst Csaba Toth told AFP. The key question is whether that unity will lead them to support Lajos Botka, mayor of the third-biggest city Szeged, as prime ministerial candidate. Botka, towering at nearly two metres (6.5 feet) in height, was put forward in December by the Socialists, the largest leftist party. A trained lawyer and ex-water polo player who cuts a formidable figure, his competent running since 2002 of Szeged, the only major city not controlled by Fidesz, has earned the 44-year-old respect across party lines. Botka has accused strongman Orban of governing like a "king" and said the time has come for "new left-wing policies." Although a recent poll put Botka almost neck-and-neck with Orban in personal popularity, his Socialist party is much less popular, tainted by its roots as a communist party and a corruption-ridden spell in government. Botka insists he will only run if the fragmented left bloc, comprising some seven parties, stands behind him - a Herculean task given their current reluctance to cooperate. Under election rules most seats are won on a first-past-the-post basis, rewarding the monolithic Fidesz. Therefore without compromises and alliances, the leftist opposition can expect "total defeat," local journalist Peter Peto told AFP. If Botka drops out, the opposite political wing could serve up the main rival to Orban - Gabor Vona, the charismatic young leader of the radical-right Jobbik party. The ultra-nationalist outfit, whose members used to burn EU flags and spout anti-Semitic rhetoric, came second behind Fidesz in 2014 with 20 percent of the votes. But when the migrant crisis hit the following year, Jobbik was outflanked by Orban's hardline anti-immigration stance and saw its support stagnate. Vona, 38, has since sought to revamp the party image, akin to moves undertaken by other far-right movements in Europe. Jewish community leaders were taken aback when he offered his Hanukkah greetings last year, while he has told the country's much-slighted Roma population that they have "nothing to fear from Jobbik". Vona's candidacy hinges on the fate of the left-wing hope Botka, according to the analyst Csaba Toth. "If Botka enters the race, that leaves little room for Jobbik... If Botka drops out, Vona has a fighting chance of leading the anti-Orban challenge," he said. The smart money, according to Toth, remains on a comfortable win next year for Fidesz, who lead both the Socialists and Jobbik by around 30 points in current polls. But some chinks have appeared in Orban's armor, giving hope to his opponents. In October he failed - despite a propaganda campaign costing an estimated 32-million euros ($34 million) - to persuade enough voters to validate his referendum on EU refugee quotas. Last month a group of young activists called Momentum Movement derailed Budapest's government-backed bid to host the 2024 Olympic Games with a referendum drive. 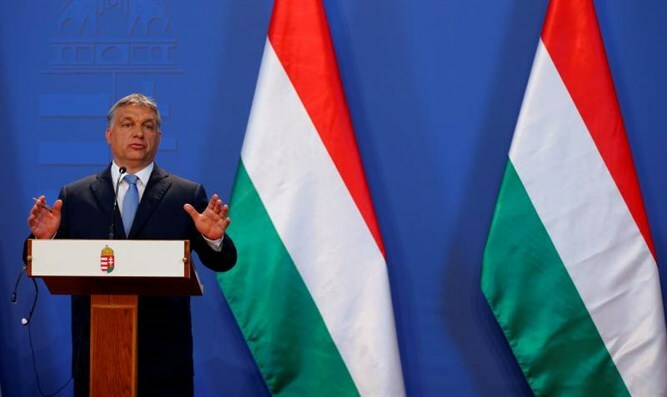 Rather than giving in to a ballot, a rattled Orban denounced the "murder of a dream" and swiftly binned the bid. Buoyed by their success, Momentum have now set up a party targeting disillusioned "political orphans," the large pool of undecided voters estimated at around 50 percent of the 8.2-million electorate. However their rejection of cooperation with any other party does not bode well for a broad anti-Orban front. However Orban's setbacks have chipped away at the widespread belief that he is "omnipotent," according to political analyst Peter Kreko. "His hold on power has been mainly built on the lack of an alternative, and maintaining a stagnant paralysed opposition. Now at last there are some fresh dynamics."